On Saturday, May 31, 2008 Leacroft will be hosting the first annual neighborhood block party. Imagine twenty-five grills cooking burgers and hotdogs for the entire neighborhood in the the pool parking lot. The evening will includes food, extended pool hours, movie night on the tennis court (featuring the latest National Treasure) and lots of fun! Help us make our neighborhood more of a community by joining the fun. The meat will be provided for FREE! Each family will need to bring, a side dish, lawn chairs and something to drink. 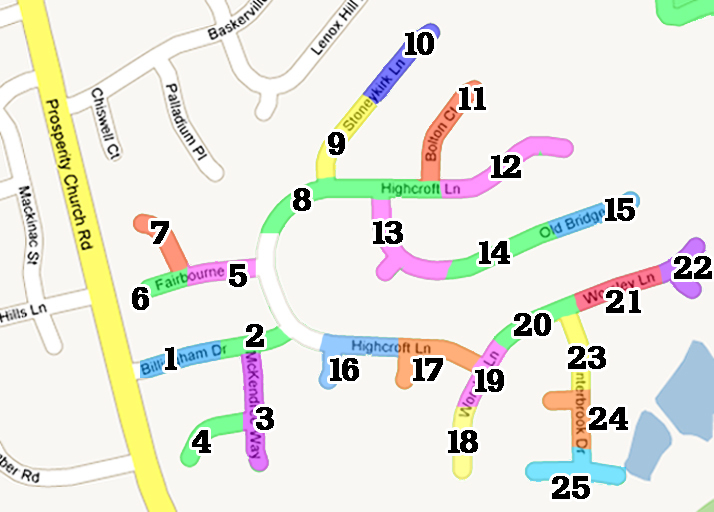 We have divided our neighborhood into twenty-five zones. (see below) And have attempted to recruit leaders and organizer for each zone. (there are some zones that are still unmanned) Each zone leader will be the contact for you if you want more information about the party. So, if you want more info, contact your zone leader. If you are will or able to volunteer for any of these openings or if you have any questions, please feel free to let us know by emailing us at leacroftblockparty@gmail.com.